This is one of the finest 1 bedroom condos in the village of Snowshoe. Enjoy the convenience of taking the elevator to the slopes and having your own ski locker adjoining the hearth room. At the end of the day, relax on one of the largest decks overlooking the village. Condo has a full equipped kitchen for dining in, or walk to the many restaurants in the village. Beautiful furnishings with custom wood trim and copper accents throughout the unit. All bedding is upgraded above Snowshoe specs for a comfortable night sleep, and lighting has been upgraded. Some other features include high speed Internet, DVD player, gas fireplace, humidifier... Highland House has laundry facilities, outdoor hot-tub, and exercise room. Split Rock pools is a 2 minute walk through the village. Recent upgrades include a flat screen tv in bedroom, pottery barn lighting and new berber carpeting. Truly one of the best 'gold' rated properties. Check-In time is after 5:00pm on the day of arrival and checkout time is 11:00 am on the day of departure. Fees are inclusive of cleaning upon departures for all parties. Housekeeping also provides linens, towels, paper towels and dish washing liquids. 12% West Virginia tax is added to all rental totals. Renting directly from us saves 15% - 25% of standard Snowshoe rates as we are passing on the management fee savings to you. However, the greatest plus is the superior accomodations to most on Snowshoe's rental program. Non-refundable rental deposit of 25% is due along with rental application upon booking. Balance is due 30 days prior to arrival and is non-refundable. Tiled bathroom with vanity sink and custom cabinets for bathroom storage. Best vacation we’ve ever taken together! I’m so glad I chose this property for my first visit to Snowshoe. We were celebrating my husbands birthday and I chose wisely! The location couldn’t be more perfect. The balcony overlooks the village so while we were thawing out from the slopes we could see what was going on. Restaurants and shops are footsteps away. I was able to take a class right off the corner of the building! The condo itself was charming, updated, comfortable and had everything you could need! We loved watching tv by the fireplace at night after dinner. The sauna & jacuzzi are literally four doors down! Oh and the bed (bc that’s what I always worry about) was so comfortable! No back complaints! We loved it so much we are eagerly planning our next trip. The owner reached out personally and answered any questions I had. It was easy checking in and out. Honestly, you couldn’t ask for a better property. Can’t wait to come back! 222 Highland House is perfectly situated. The deck overlooks Snowshoe Village, the hot tub and sauna for the building are on the second floor literally steps from your condo. The ski lockers on the lobby level exit between Skidder (beginner) and Ballhammer lifts. Walk out the front door of the lobby and across the promenade right into Foxfire Grill. 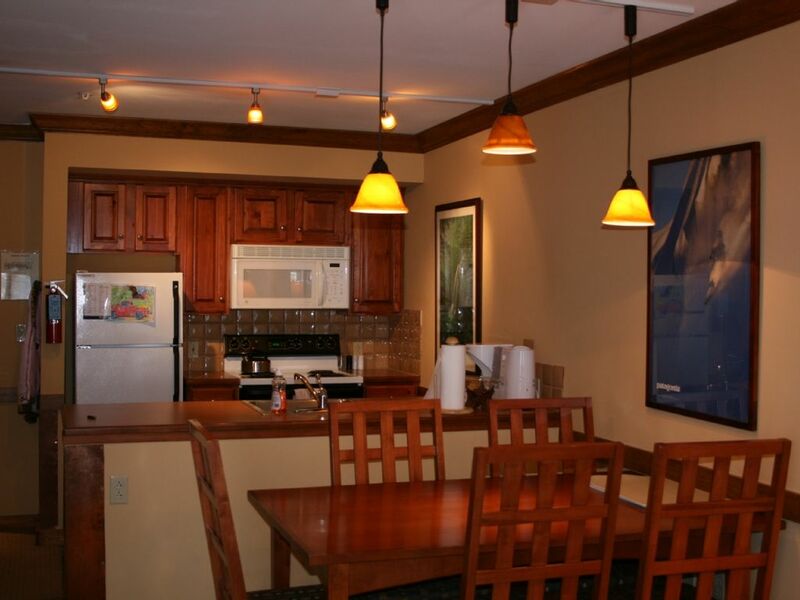 The condo itself is small, like most in ski resorts, but has what you need to enjoy the stay. The gas fireplace is definitely a nice feature. We could not have asked for a better place to stay for our first time at Snowshoe. The cozy condo had everything we needed - perfect location for access to the slopes, walking around the village and eating at the amazing restaurants. It felt super deluxe with the fireplace, large balcony and hot tub right down the hall. We felt right at home and can’t wait to come back! Thank you so much for sharing your beautiful place with us. We had an absolute blast. Perfect location for everything on the mountain, restaurants and bars all only a short walk. Saturday night we were treated to the most incredible sunset I’ve every seen. We will definitely be returning. Joe - glad you guys enjoyed and the weather was good. Thanks for staying with us and taking the time to review our home. Loved our stay and the owner was fantastic! The 1 bedroom condo in Highland House was perfect. We had a group of three, so we used the bedroom and pull out sofa. There was plenty of space for us all. We didn't really get to use the balcony, but it was large and really nice with a great view of the sunset. We were right down the hall from the hot tub, which is super convenient. Great location to walk to everything in the village- highly recommend! Highland House is located in the heart of Snowshoe Village and on the slopes for direct access during winter skiing. There are numerous activities in summer and winter, with a lake for fishing and Cass Railroad only 30 minutes away. % restaurants located in the village along with Starbucks. Snowshoe offers shuttle buses (every 15 minutes) to Silver Creek ski area and snow tubing location. Park your car when you get here as you will not need it unless you plan to make a trip to Cass or go antiquing in Marlinton or one of the surrounding towns. 25% Deposit due at booking.